If you have a grandparent still alive and willing to tell you their life story don’t hesitate to listen. If we don’t listen and write down the rich history we are provided it will be lost forever. Yvette thinks about all the times she could have spent time with her grandmother, but instead chose to do other things. There were so many more stories she could have heard, family history provided. Yvette didn’t even have to ask, her grandmother would have shared with her, but when you are young you think you have next time. 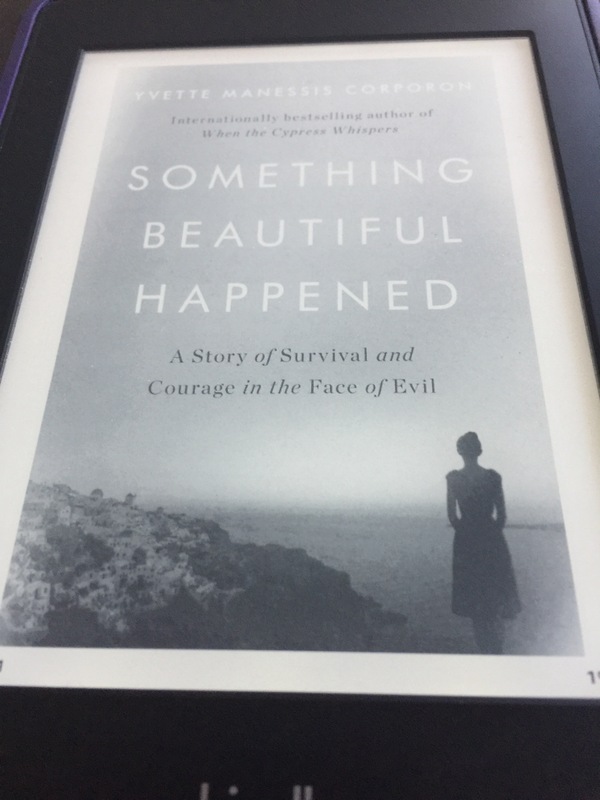 If you like to read about World War II, then I highly recommend, Something Beautiful Happened, by Yvette Manessis Corporon. This memoir is about the author’s search to find out the truth behind her grandmother’s story of helping save a Jewish family during the Holocaust on the small Greek island of Erikousa. Yvette grew up visiting the island and her grandmother during the summer, so she knew the island well. Her grandmother told her that the whole island kept this family a secret from the Nazi’s. Yvette decided she wanted to find the descendants of this family, to find out what had become of them. Yvette’s journey takes many twists, turns, some of them heartbreaking, yet still rewarding. I’ve read countless memoirs on World War II, but this one packs an important punch. Yvette writes in such a way that you feel as though you are actually there on the island, at her grandmother’s house. I have never been interested in Greece before, but after reading this book I would like to go visit the island of Erikousa. I was provided the e-book ARC of Something Beautiful Happened by Yvette Manessis Corporon for free from NetGalley in exchange for my honest review. This book was breathtaking.